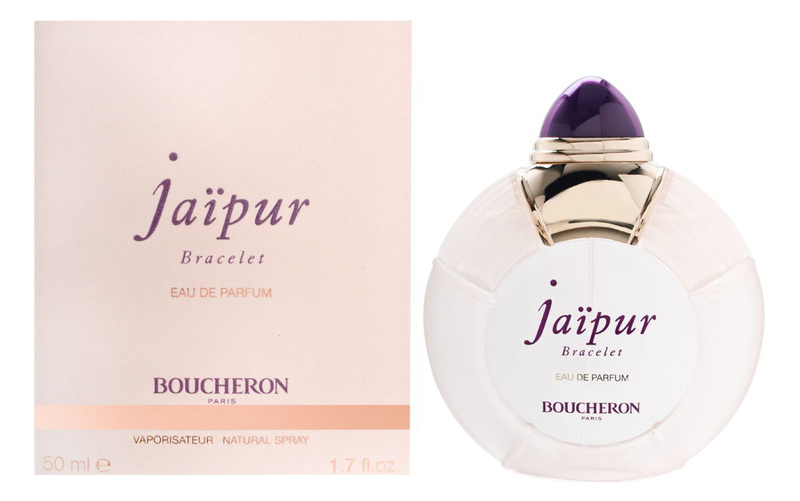 Jaïpur Bracelet is a perfume by Boucheron for women and was released in 2012. The scent is floral-fresh. It is being marketed by Inter Parfums. The opening reminds strongly of Pure Poison, but it's just for a minute. Jaipur Bracelet quickly becomes a skin scent, which is a pity. Today however is not a particularly hot day, on the contrary, so perhaps this is affecting the scent reaction on my skin. I will have to try it again in hotter days. Back to the notes: at first spritz violets come forward, heralding the uplifting freshness of spring in all its glory. It's a clear and delightful note, not too sweet or heady. About one hour into wearing it, the scent has gone rather quiet already. I just about can detect a ghostly bitter orange hand in hand with hyacint - by sniffing my wrist from very close. These two create nonetheless a lovely concoction, well balanced and classy. I don't find any iris, or carnation, just a tad of petigrain and neroli notes, faintly blending with the others. Jaipur Bracelet is enchanting in its extraordinary balance speaking of mastery, and I love it, BUT: the weakness of sillage and longevity are a great disappointment. As things stand, I would have to re-apply every hour or so in order to enjoy this magic spell. Perhaps it's not by chance that Pure Poison and Jaipur Bracelet have been created by the same nose: they are fantastic frangrances, but both lack sillage and longevity. UPDATE: After 24 hrs it is gripping on my wrist where I sprayed it about 10 times, but I have to stick my nose to the skin. I went out on a little testing mission recently, initially only to try out some Guerlain frags. I didn't realise that the first store I went to doesn't carry Guerlain, and disheartened I strolled around rejecting all the usual gumph until I spied this glorious pink bottle (I'm a bit of a sucker for pink!) lurking on the bottom shelf of a display case. A faintly herbal and very fresh opening quickly subsides to really high quality muguet and soft, watery hyacinth. Lily of the Valley can sometimes have a very 'screechy' effect if handled without care. It's beautifully blended in Bracelet, bringing just the right amount of soft powder to the composition. A fair bit of Iris keeps Bracelet on the dry side into dry down ... which is comfortably lengthy! The remarkable note here, however, is the sparkling violet leaf (reminding me a touch of Grey Flannel) wending it's way all the way down into the superb Cypress base. Gents, look past the packaging of this one and try it, as Bracelet falls into a slightly more formal place than 'girly pinkness' to my nose. It makes a lovely change from the rest of the boring masculine fare out there! It's official ... I'm seriosly in love with this fragrance! It is posessed of superior sillage and longevity and made with high quality ingredients, as befits a fragrance from the makers of exquisite, high end jewellery! Definitely one to lay a stock of in. Write the first Review for Jaïpur Bracelet!